Choice Hotels has launched a double Choice Privileges points promotion for stays between December 15, 2016 – February 9, 2017. Members can earn double points with a maximum of 30,000 bonus points earned. This promotion is valid at all Choice brands with minimum daily rate of $40. You can access and sign up for this offer on Choice’s website here. Note that this promotion is valid for Choice Privileges members with an account address in the United States or Canada to be eligible for this promotions. Members tend to prefer those Choice Privileges promotions that come with a set number of points for every two stays (usually 8,000). These are good for those with low daily rates. This double points offer works better when the daily rates are higher. *Registration required at ChoiceHotels.com/doublepoints before check-out. Members must book trips via ChoiceHotels.com, the Choice Hotels mobile app, or 800.4CHOICE at qualifying rates. Corporate travelers may book through a travel agent or corporate online booking system. Choice Privileges member number must be provided upon check-in. Between 12/15/16 and 2/09/17, members will be awarded double bonus points for every qualifying stay, up to 30,000 bonus points. Trips at vacation rental property locations and stays booked with the SEGEN rate code do not qualify for promotional bonus points. To be eligible to earn the bonus, members must set their earning preference to Choice Privileges points in their online account. Any change made to earning preference will remain in effect after the promotion has ended. Allow 72 hours from check-out for points to post. You must maintain an address in the U.S. (including U.S. territories) or Canada to be eligible for this promotion. 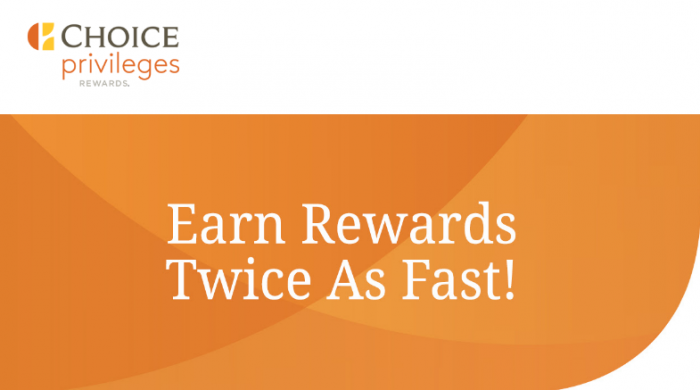 For Choice Privileges program details, eligible rates, eligible countries and point redemption rules, visit www.choiceprivileges.com. Hotels are independently owned and operated. 1 Choice Hotels guarantees that the best rate available for any Choice brand hotel will be on Choice Hotels websites, through our call centers, or by calling the property directly. If a guest finds a lower online price for the same hote, type of accommodations, the same dates and the same terms at any other qualified online source, we’ll honor the lower price and U.S. residents will receive a $50 reward card. International residents will receive their first night free for that stay. Other restrictions and terms and conditions apply. Click here to review the complete Lowest Price Guarantee Terms and Conditions. 3 To maintain an active status in the Choice Privileges Rewards Program and retain accumulated Choice Privileges points, you must engage in qualifying activity beginning with the first day of the month after your activity is completed through the eighteenth consecutive month of inactivity, such as completing a qualified point-eligible stay, earning points, airline miles or AMtrak Guest Rewards points, redeeming Choice Privileges points, earning points from a purchase using your Choice Privileges® Visa® card, earning points with one of our partner programs, purchasing points and referring a friend. Choice Privileges points will be forfeited in accounts with no qualifying activity during the previous 18 consecutive calendar months. 1. How does the promotion work? After registering for our promotion, you will receive double base points of any qualifying stay, with a maximum of 30,000 points. 2. What are the dates of this promotion? Check in between December 15 and February 9 to earn. 3. Promotion ‘registration’ is required – where do I register? 4. What are the booking requirements? Book via ChoiceHotels.com, the Choice Hotels mobile app, or 800.4CHOICE. Don’t have the app? Download it in the app store. Elite Diamond and Elite Platinum can book directly with a hotel. 5. How many times can I earn “double points”? You can earn the bonus unlimited times during the promotion period, up to 30,000 points. As a corporate traveler, you can book your stays through a corporate booking system to qualify. However, stays booked with the SEGEN rate code do not qualify for promotional bonus points. 7. What is a ‘qualifying rate’? 8. How many points am I awarded after each trip? After every second qualifying trip, you will be awarded a minimum of 5,000 points and a maximum of 8,000 bonus points, depending on how many base points were earned from your two (2) separate trips. These bonus points will allow redemption for a free night at the 8,000 point reward night level at over 1,500 hotels. A free night at most Choice Privileges locations requires more than 8,000 points. 9. I am an elite member—do I get awarded “double points” on my elite bonus as well? No, you do not get a double elite bonus. You will earn ‘double points’ on the base points that you receive for your stay. 10. When will the bonus points post to my account? Please allow 72 hours from check-out for your points to post. Points from stays at international locations can take longer to post—please allow up to 20 days. 11. What can I do with my Choice Privileges points? You can redeem your points for free nights, gift cards, and other great rewards! Check out www.ChoicePrivileges.com for more details. 12. If I’m earning Airline Miles or Amtrak Guest Rewards instead of points, am I still eligible for the bonus? No, you must set your earning preference to Choice Privileges points (under “Manage Loyalty Programs”) in order to participate in this promotion and receive your free night. 13. Are Vacation Rental trips included in the promotion? 14. Are international trips included in the promotion? 15. When do my Choice Privileges points expire? 16. What is considered ‘qualifying activity’ to keep my points? 17. What is the Advanced Purchase Rate? 18. Who do I contact if I have further questions? If you have further questions please contact Choice Privileges Service Center.